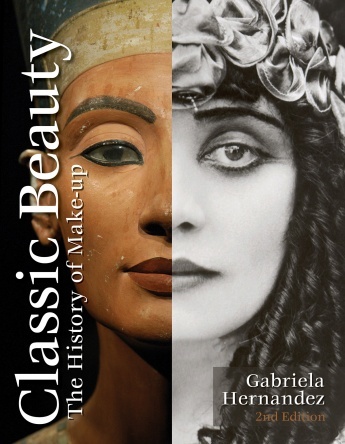 Schiffer Publishing, Ltd., would like to re-introduce you to Gabriela Hernandez's Classic Beauty: The History of Makeup. This illustrated history of facial beauty ideals and the evolution of cosmetics from ancient times offers product development timelines and color-correct vintage palettes for each decade, from the 1920s to today, as well as corresponding application guides. The definition of a beautiful face has never been constant. See how political and social climates have molded accepted beauty rituals and the evolution of cosmetics from ancient times through today. This updated and refreshed reference book chronicles historic trends for the eyes, lips, and face, and offers in-depth aesthetic reviews of each decade from the 1920s to today. Follow the fascinating history of cosmetic trends through vintage ads; detailed makeup application guides; and profiles of famous makeup innovators, connoisseurs, and iconic faces. Over 450 images, timelines, and detailed vintage color palettes show the changing definitions of beauty and document makeup innovations (the first mascara, lipstick, eyeshadow, etc.). This is an ideal reference for the professional makeup artist, cosmetologist, educator, student, and general makeup enthusiasts. Gabriela Hernandez, founder, and CEO of Bésame Cosmetics is an accomplished artist, photographer, and cosmetics historian. Her photography has been published in Bon Appétit, L.A.Times, and Shape. Gabriela lives in Los Angeles with her husband and two children. Schiffer Publishing, Ltd. is a family-owned, independent publisher of high-quality books. Since 1974, Schiffer has published thousands of titles on the diverse subjects that fuel our readers' passions. From our traditional subjects of antiques and collectibles, arts and crafts, and military history, Schiffer has expanded its catalog to publish books on contemporary art and artists; architecture and design; food and entertaining; the metaphysical, paranormal and folklore; and pop and fringe culture, as well as books for children. Visit www.schifferbooks.com to explore our backlist of more than 5,800 titles. If you enjoy learning about the history of makeup you may also have interest in learning a bit more about the history of fashion in our terminology section. Also, here on the fashion blog you can watch the 100 Years of Fashion video. Don't forget to also visit our fashion industry history page for additional resources of information.